I was granted money from EPINOR to stay three months at the National Institute of Environmental Health Sciences (NIEHS) in North Carolina. The aim of the stay was to work on the first study in my PhD on maternal pre-pregnancy body mass index (BMI) and risk of cerebral palsy (CP) in offspring. My PhD project is part of a large epidemiologic study on CP initiated by the National Institutes of Health (NIH) in USA. The Principal Investigator of the study, Dr Allen J Wilcox, works at the Epidemiology Branch at NIEHS, NIH. 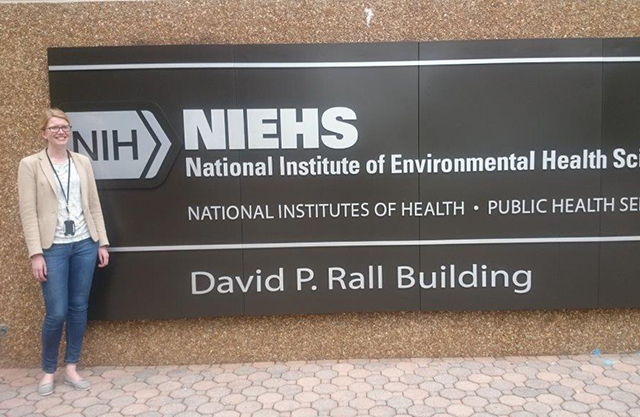 NIEHS conducts research on environmental health and environmental-related diseases, and is one of 27 research institutes and centers part of the NIH. During my stay I worked closely with Dr Wilcox and my supervisor Mette Christophersen Tollånes. We had weekly meetings where we discussed and evaluated results from the analyses. During my research stay I also got the opportunity to attend weekly journal clubs and attend presentations with distinguished medical researchers. At the end of my stay I presented the results from the study for the Epidemiology Branch at NIEHS and got valuable feedback on methods, interpretation of results and possibilities for further work. This research stay gave me a great start on my PhD and has been very valuable for my epidemiological training. I am very grateful to NIEHS and Dr. Wilcox for giving me this opportunity and to EPINOR for financial support.